There is a major funding crisis going on in academic medical science. You may have heard about this on NPR recently with two stories on the difficulties young researchers face in getting funding (here's the second story on this), and another on some of the systemic funding issues that go beyond just increasing research dollars. The majority of funding for research done at academic institutions comes from the National Institutes of Health (NIH) a subsidiary of the US Department of Health and Human Services (HHS). The budget for HHS and the NIH is set by congress and, while there was a boom in funding from 1998-2003, since that time, with adjustment for inflation, the NIH budget has decreased (see red line in figure below). “NIH Research Funding Trends FY1995–2012,” by Kim Ngo and Howard Garrison. During the boom in funding from 1998 to 2003, research at universities, especially this one, expanded at a rapid rate. You may have noticed this in Ann Arbor at the time the Biomedical Sciences Building (construction started in 2003 and finished in 2006) and the Life Sciences Institute (Construction started in 2000 finished in 2003) were built. There was all sorts of expansion from 1995 to 2003 to accommodate the expansion of graduate students during the boom years. However, when NIH funding stopped increasing at the 1995-2003 rate the number of grants available to young investigators began to decrease as the number of PhDs looking for faculty positions began to increase. Here's a graph that shows this over time looking at R21 grants which are meant as a sort of startup/new idea grants for young investigators. For around the same number of awards given in 2004 we have more than double the number of applicants. Doing some rough math for this in 2004 approximately 20% of applicants were awarded an R21 now we are down at 13%. 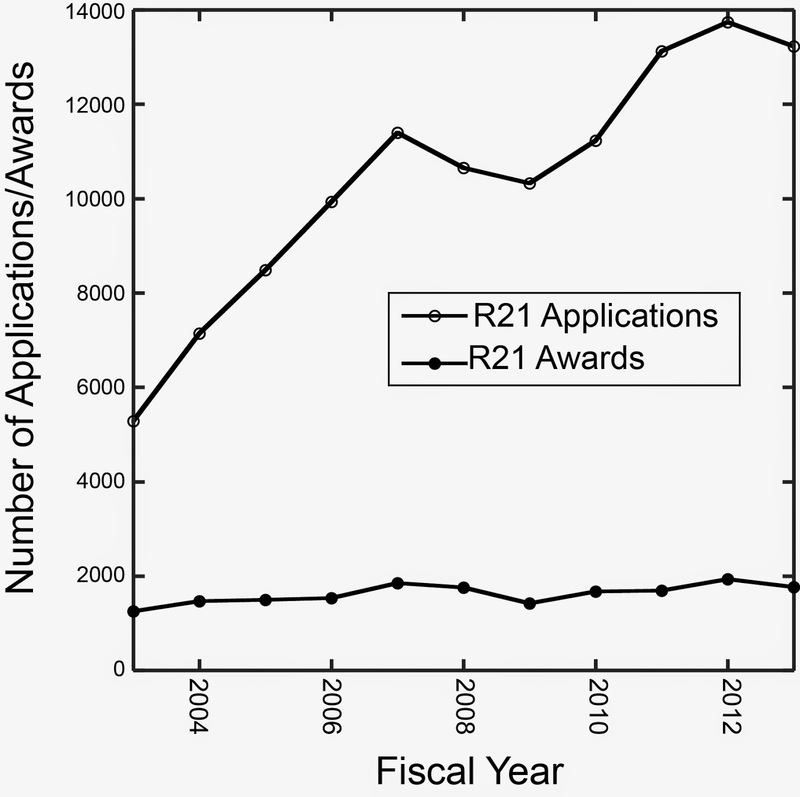 Similar trends are true for RO1 grants which are larger grants awarded to, generally, more mature labs. These are two of the major grant types that sustain whole labs. There are awards from the NIH and smaller foundations, such as the Multiple Sclerosis Society, which can fund individual researchers within a lab by paying their salary and giving a small amount for lab supplies but these are not enough to sustain a lab alone. We are currently in the middle of this funding crisis. If everything continues without intervention we will have an even larger number of applicants for a stagnant number of awards. While increasing the NIH budget will help alleviate this in the short term, it doesn't fix the systemic problem that graduate schools are training more people for a job that has a diminishing number of slots to fill. While I agree that NIH funding should increase, which I can discuss in another blog post, I think that graduate schools must expand the training of their PhD candidates to fill other requirements within the scientific community. While there is growing interest in science (take the impact of The Cosmos reboot with Neil DeGrasse Tyson or the popularity of Radiolab on NPR as examples) there is not an emphasis on delivering scientific information to the general public in virtually any graduate program. There is concern over decreasing budgets for NASA and the NIH, but stories about NIH and NASA-driven innovation don't make the news. There's a need for great storytellers of modern scientific endeavor.